Good morning everyone! I hope you're having a fabulous weekend! Today I will have plenty of time to spend in my craft room playing with all my new catalog goodies! I'll have lots of great things to show you this week! Here is a card that I created for the Stampin Connection SCCSC121 sketch challenge. 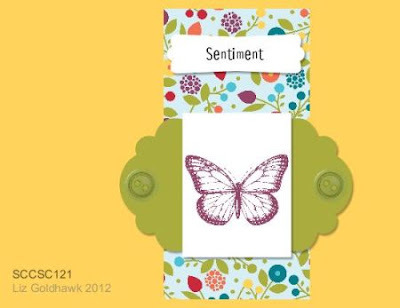 Accessories: Beautiful Butterflies die, Beautiful Wings sizzlit, Apothecarty Accents framelit, Bitty Banners framelit, Glimmer Brads, Mini Glue Dots, Rhinestones, Stampin' Dimensionals. I started off with a piece of Pool Party card stock cut at 5-1/2" x 8-1/2" and scored at 4-1/4". I stamped the Woodgrain background image onto the card front in Pool Party ink. This adds a subtle background pattern. I've been loving the woodgrain look lately...don't know why. Next I cut a piece of Patio Party DSP 2-1/4" x 4" and adhered it onto the card front. Then I cut a piece of Whisper White card stock 2-1/4" x 2-1/4". I stamped the blossom from Betsy's Blossoms in Midnight Muse ink and Pool Party ink. Can you see how solid and dark those Midnight Muse flowers are? I LOVE the new ink pads! My Pool Party ink pad is still the old felt style and you can tell. I stamped the Midnight Muse flowers first, then the Pool Party flowers not really paying attention to the order. I think it's interesting how you can clearly see the Pool Party flowers on top of the darker Midnight Muse ones. Next I cut a piece of Midnight Muse card stock 3-1/4" x 5-1/4" and ran it through the Big Shot on the Apothecary Accents framelit. I uses Paper Snips to cut the die cut shape to get just the ends of the label. I adhered the labels on top of the sides of the stamped Whisper White card stock. Then I used the Paper Piercer and Mat Pack to pierce a hole in each end of the label and added a Glimmer Brad. I ordered the new Paper Piercing Tool and Stampin' Pierce Mat, but they hadn't arrived when I made this card. I adhered this label panel onto the card front with Stampin' Dimensionals. 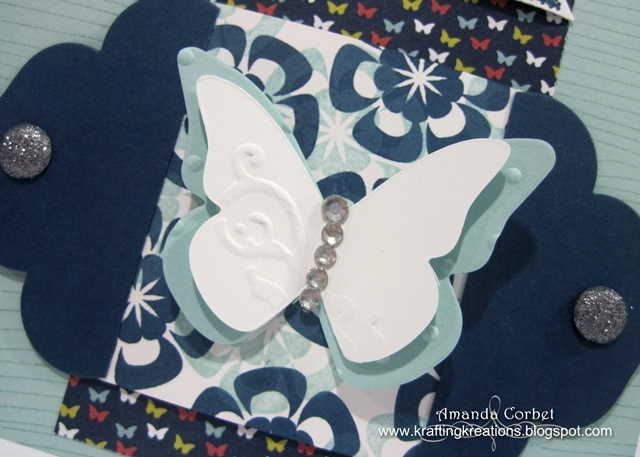 I had these two butterflies already sitting in a box of scraps so I pulled them out, adhered them together with a Mini Glue Dot and adhered it onto the stamped panel with a Mini Glue Dot. I added some Rhinestones to create the butterfly's body and add some more sparkle. What can I say...I love sparkle and bling! Now for the greeting. 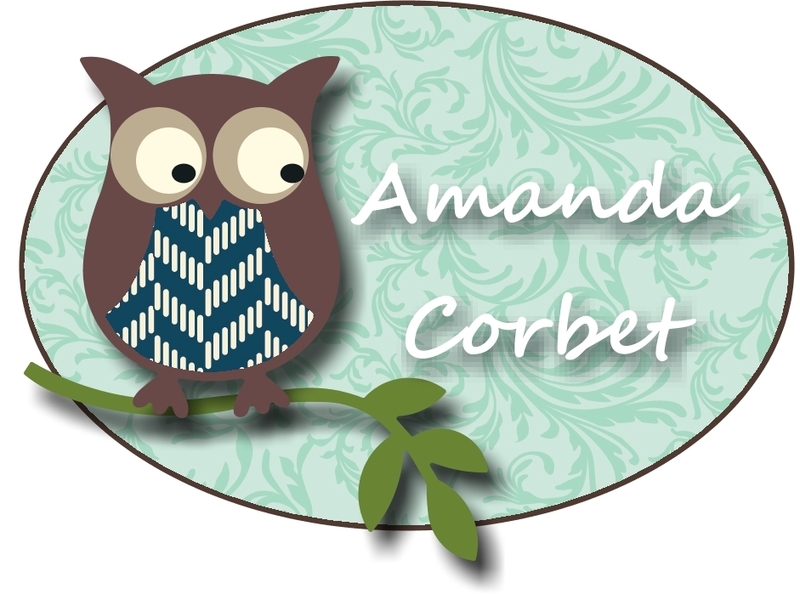 I stamped the banner from Itty Bitty Banners in Midnight Muse ink and then used the Bitty Banners framelits to cut out the stamped image. 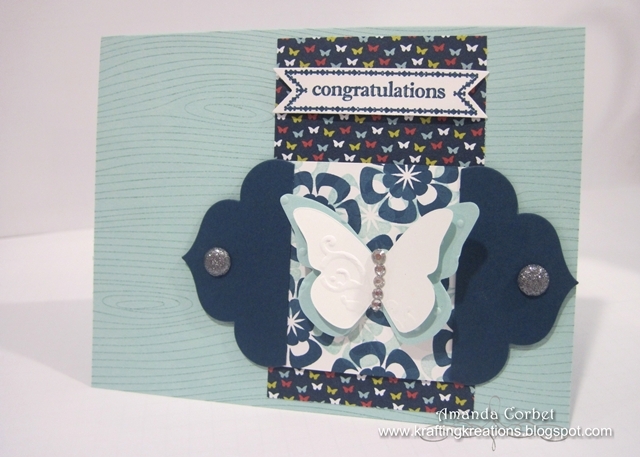 I adhered the banner onto the card front with a couple Stampin' Dimensionals. I just love how this turned out. I'm loving all the wonderful new framelits in the new catty. They were at the top of my list for my first order and you will see some creations using them later this week! For the Birds - Friday Mashup 62! Introducing the New In Colors! For You Mini Photo Album and Blog Candy!